A track renamed in his memory. Many places in New Zealand have been renamed in honour of First World War soldiers as a special gesture of remembrance, but not many have been officially renamed after one person. Hubert Earle Girdlestone was a special case. Hubert loved the outdoors. He worked as a surveyor for the New Zealand Government, was an alpine climber and was a Fellow of the Royal Geographic Society. Photos that he took of New Zealand land are held in museum collections and the work he did as a land surveyor was incredibly important because of how undocumented New Zealand still was at that time. 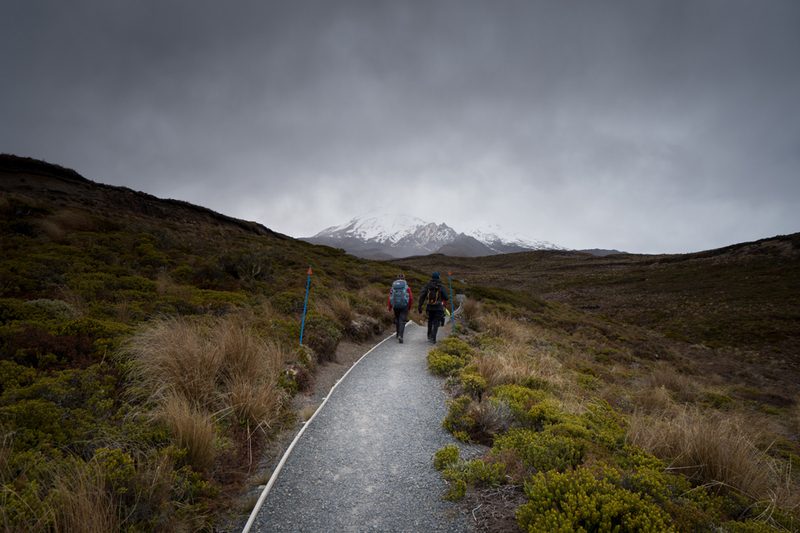 He especially loved the Tararua Ranges, and spent a lot of his time there, working and climbing. When he served overseas, his surveying skills were recognised and he even took photos of the land at Gallipoli. It seemed right that when he was killed in action during the war that the land he recorded and loved so much was renamed in his honour. Those who climb the track, do so in his memory. You have been given The Girdlestone Track map - named after the surveyor Hubert Girdlestone. You are now tasked with discovering more of the story behind Hubert Earl Girdlestone. How much of his story can you piece together? The suggestions below will help you on your research journey. The How We Find It Fact Sheet will also be a helpful tool in helping you discover the pieces of Hubert's puzzle. You're in luck. 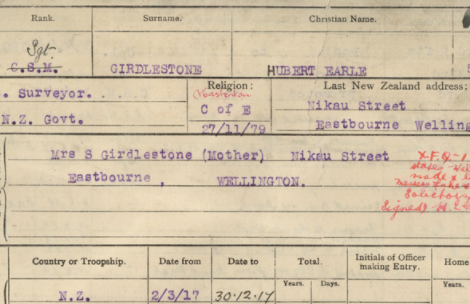 Hubert served in the New Zealand Army so his records can be found online at the Auckland War Memorial Museum Cenotaph. This is your most important search. Collect as much information as you can. Once you've found Hubert's Serial Number move to Archway and search for his service documents there. WHY Did hubert have a track named for him? You are holding a map of Girdlestone's Track. After the First World War New Zealand created many different memorials to friends, family and community members. In Hubert's case his friends re-named a series of locations in his honour as a direct result of his job. Use Papers Past and Google to discover what Hubert Girdlestone did for a job and which points have been re-named in his memory. find what hubert did for a job? Hubert's mother, Sarah Girdlestone, would have had a special card delivered to her with a photo of Hubert's grave and the exact location should she ever be able to visit. Use Hubert's Service Number to search for the location of Hubert's grave. Download the Cemetery Plan and use it in conjunction with Google Maps to find his final resting place. Discover more parts of Hubert's story. HOW DID THE EASTBOURNE COMMUNITY FAREWELL HUGH? Many soldiers had elaborate farewells thrown for them upon their departure to the Front. Soldiers received many different types of presents to take with them - wristwatches were very common. Use Papers Past and the search term ' Hugh Girdlestone' to find what type of farewell the Eastbourne Community held for Hugh. What was the gift that they gave him? After Hugh was killed what type of memorial was planted for Hugh? Is it still there today? Can you find it on Google Maps? what other types of first world war memorials did people establish in new zealand? Virtually every township has one, usually in the main street. Excluding the many honours boards and plaques in schools and churches, there are well over 500 public memorials to the soldiers of the Great War, 1914 - 1918. Use the NZ History War Memorial Register to find the war memorial closest to you. Is there one missing from the register that you know about? If so let NZ History know so they can add it to the list. why can't we find a member of hugh's family to talk to about his story. There were many Girdlestones in the Eastbourne and Muritai area. This article about Hugh's brother Guy, gives us clues about the Girdlestone Family. Archway gives us his parents' names; Papers Past and Google give us school awards and memorial notices. Can you create a family tree of the people in Hugh's family? How many of them can you connect? What happened to them all? Did his brothers survive the war? is hugh's memorial plaque still at the top of girdlestone peak? This article talks about the fact that Girdlestone Peak had formerly been known by Pakeha as Little Matterhorn. It also makes reference to a Memorial Tablet that is located at the top of the peak. We wonder if the tablet is still there today? It was still there in 1924 according to this article. We'd love to know if this was the case. Perhaps someone who receives this map of Girdlestone's Track will be able to contact someone who would know. Map of Girdlestone's Track is connected with the story of Hubert Earle (Hugh) Girdlestone who attended Wanganui Collegiate and Napier Boys' High School. The original map is held by Archives New Zealand - Te Rua Mahara o te Kāwanatanga. #NLNZ ALMA999577003502836. It is this project's understanding that Hubert has no surviving relatives. Hubert Earle "Girdlestone's Peak" at Tongariro National Park. The Walking with an Anzac Team found the first clue in Hubert's story when they visited Napier Boy's High School. 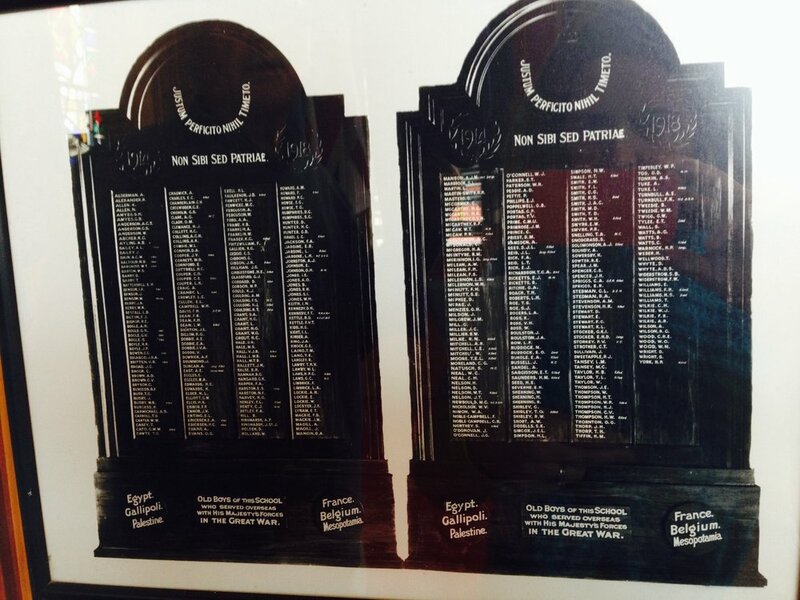 The school has a Roll of Honour in the Memorial Hall. Further research on the same platforms you have used today allowed us to discover Hubert's Story.